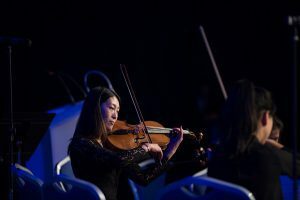 Musicians from the Zhejiang Conservatory of Music (ZJCM) visited the University of Nottingham last week for a wonderful week-long programme of events, culminating in a special gala performance at the Nottingham Albert Hall. Organised by Nottingham Lakeside Arts and the University’s Confucius Institute, the 21 guest musicians from ZJCM – a publicly funded institution located in the south-west of Hangzhou, the capital city of Zhejiang Province in east China – took part in the first ever UK tour, which saw them deliver performances and special musical events throughout the week. An ensemble from the Conservatory delivered a stunning performance at the University’s Knowledge Exchange and Impact Awards on Thursday 22 November to an audience of 250 guests. A musical send-off took place on Friday 23 November for members of a Midlands Engine Delegation heading to China to forge commercial links and increase trade. The musicians performed at Nottingham’s Council House before the 18-strong delegation of senior government and business representatives, led by Midlands Engine Chairman Sir John Peace, flew to Beijing. And performing at Nottingham’s Albert Hall on Saturday 24 November, the unique and combined large-scale ensemble of choral and orchestral musicians from China and Nottingham performed Li Huanzhi’s Spring Festival Overture, Rachmaninov’s The Bells and concluded with the complete suite from Gustav Holst’s tour-de-force The Planets, performed alongside astrological digital projections by Nottingham-based artist Barrett Hodgson. The packed schedule also included a performance at the University of Sheffield; a lunchtime concert in the University’s Recital Hall for the public and 80 students from Confucius Institute classrooms; and a rehearsal with the BBC Symphony Orchestra featuring cellist and Young Musician of the Year (2016) Sheku Kanneh-Mason at Nottingham’s Royal Concert Hall. 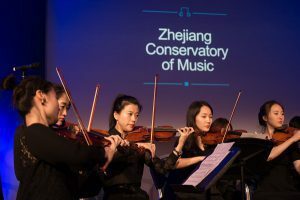 The Zhejiang Conservatory of Music offers a wide range of music and arts teaching for talented students from China and beyond and is renowned as a premier music education provider committed to academic and artistic excellence. 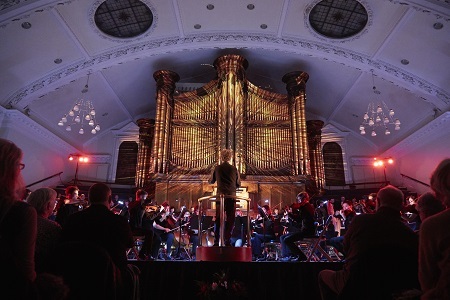 The appetite for the UK tour has grown from successful collaborations between the University of Nottingham and the Conservatory, with both organisations now looking to build on this success and explore future creative collaborations.